The first time I saw the trailer for Jakob the Liar, it was immediately followed by an ad for The Insider. The two both focused on issues of truth and deceit, and they could not have been more opposite. Jakob the Liar is an adaptation of Jurek Becker’s novel about a Jew who brings hope to his fellow Jews during the Nazi occupation of Poland by pretending to own a radio and inventing stories of Allied victories. The suicide rate goes down and, simply put, his lies save lives. The ad for The Insider, on the other hand, focuses on journalists who want to expose the lies that are foisted on the public by tobacco companies. Lies, in that film, are dangerous and deadly. 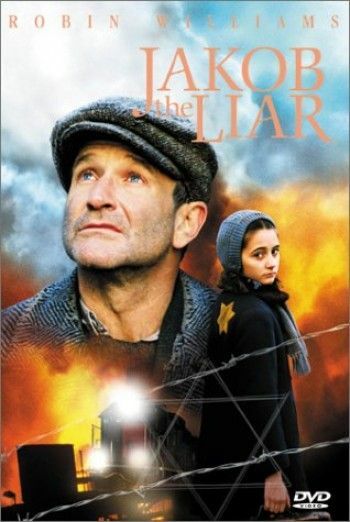 Because Jakob the Liar stars well-known comedian Robin Williams, it will inevitably invite comparisons to Life Is Beautiful, Roberto Benigni’s funny fable about a father who convinces his son that the concentration camp they are living in is really just a game. But where Benigni’s comedy sometimes seemed too whimsical or contrived, Jakob grounds its humor in an essentially dramatic, and somewhat more believable, story. For one thing, Jakob’s lies do have the proverbial kernel of truth. Sent to the commander’s office for being outside past his curfew, Jakob happens to hear over the Nazis’ radio that the Russians are relatively nearby. Jakob passes this bit of news to a friend, who mistakenly believes that Jakob heard it over his own radio; before long, all the Jews living in the ghetto are coming to Jakob for more scraps of information. In the absence of fresh news, Jakob reluctantly embellishes his one known fact. I have to admit, stories such as these have always bothered me a little. It’s easy to see why Hollywood would make movies about the social and psychological benefits of telling tall tales, but I tend to be a stickler for truth and objectivity, however bleak these things might be. It’s also sad to see people giving up on God — as at least a few characters do in this film — and relying on someone else’s make-believe for hope instead. And yet, at the same time, I can’t deny it is our imagination that makes hope possible; it is imagination that gives our lives meaning beyond the mere fact of our existence; it is imagination that keeps faith, hope and love alive when everything around us conspires to kill these things; and it is ultimately through imagination that we encounter God and, truth be told, each other. In The Silver Chair, C.S. Lewis describes how the Green Witch convinces our heroes Eustace, Jill and Puddleglum that neither Narnia nor Aslan really exist, and that the only real world is the Witch’s world, dark and deep below the ground. But cynical Puddleglum isn’t satisfied. Even if Narnia and Aslan are merely “made-up things,” he says, they still “seem a good deal more important than the real ones” in the Witch’s world. In a time when the Nazis reigned through systematic brutality, Jakob’s lies do focus his friends’ attention on the “more important” things. Plus there is a crucial difference between Jakob’s lies and those of the tobacco companies in that other film. The tobacco companies tell lies to further their own selfish ends, at the expense of other people.